9x12, xxiii + 187 pp. Herbeck: Wohin mit der Freud? In April 1858, the directors of the Gesellschaft der Musikfreunde in Vienna selected Johann Herbeck (1831–77) as the founding conductor of their new mixed chorus, the Singverein. Already the conductor of the Wiener Männergesang-Verein since 1856, Herbeck eagerly embraced the challenges of his new position, composing several fine settings of German text for mixed chorus in 1858. By 1875 his output in this genre had reached over four dozen compositions, twenty-four of which are presented in this edition, along with an additional version of one of them for men’s chorus. These works range from tuneful, strophic songs to more extensive, sophisticated compositions. 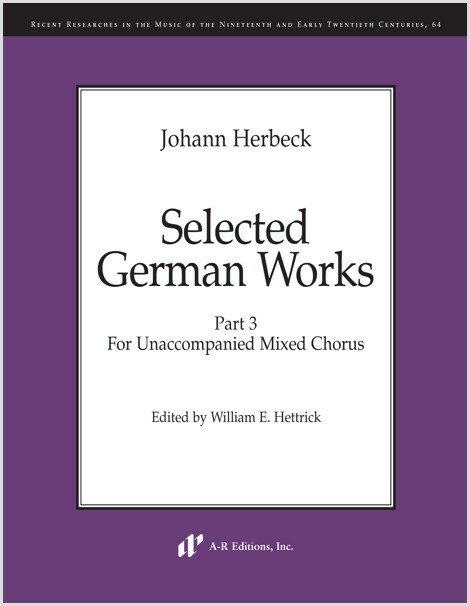 Herbeck programmed some of the former in Singverein concerts as folksongs, concealing his authorship in order to avoid criticism. He even passed off two choruses as the work of Hans Leo Hassler and Melchior Franck. The repertoire in this edition reveals Herbeck’s mastery of choral composition.